Transport more tools, keep productivity high and lower the risk of injuries and worker compensation claims by installing the right ladder-rack solution on your Ford Transit. Prime Design’s ergonomic, patented and award-winning solutions have helped business owners around the world eliminate or reduce the costs, stress and business pressures caused by work-related injuries. 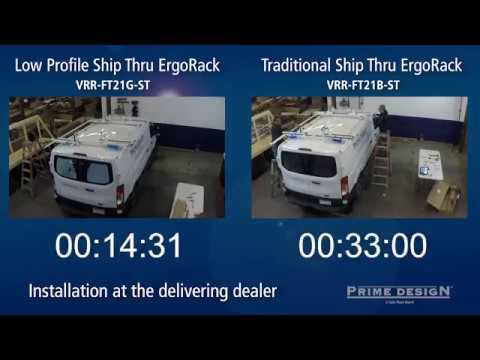 Click here to see how Prime Design’s ErgoRack and AluRack look on Ford Transit vans. Designed to fit within the narrow dimensions of a rail car when installed on your work van, this innovation is the industry’s only ladder rack for safe and productive fleets that incorporates true “ship-thru” installation and delivery technology. Watch the Installation Advantage of the ErgoRack Low Profile in this video.